The US says it will investigate reports that the CIA is running secret jails in eastern Europe and that planes carrying detainees used European airports. 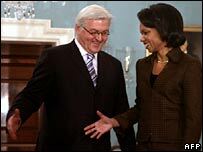 Secretary of State Condoleezza Rice told German Foreign Minister Frank-Walter Steinmeier that she would look into the claims. Ms Rice's spokesman said that EU concerns about the claims were "legitimate" and deserved a response. German media says the CIA have been using German airports to move suspects. Last week, the European Union said it would formally ask the US to check reports that it operated secret CIA prisons in eastern Europe. Mr Steinmeier, recently appointed foreign minister in a government headed by new Chancellor Angela Merkel, raised the issue with Ms Rice on a trip to Washington. He said Ms Rice pledged to "provide a prompt and detailed response" to an EU request for clarification of the report. Ms Rice's spokesman, Sean McCormack, said that the US would do its best to respond to the allegations. He did not comment on whether or not the prisons existed, but said that the US abided by its international obligations, adding: "The United States in its actions does not break US law." US officials had previously said little about the reports. The issue is expected to dominate a visit by Ms Rice to Europe next week. German media have claimed that the country's airports were used more than 80 times by CIA planes transporting terror suspects to allegedly covert jails. The BBC's Tristana Moore in Berlin says the allegations come at an awkward time for Chancellor Merkel's government. She has pledged to strengthen trans-Atlantic relations which hit a low when her predecessor, Gerhard Schroeder, attacked the US-led war in Iraq.